Here’s a little-known Act! short-cut that you’ll find very handy for sharing contact information. When looking at a contact in your Act! database, use the Edit tab on the top menu bar to quickly copy and paste contact details from Act! into an email. It’s an easy way to share information. 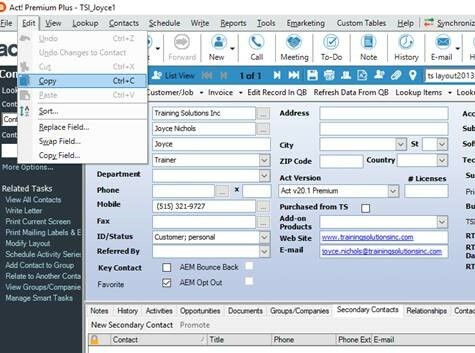 In fact, one customer who is a regional sales manager uses it to instantly email new or updated customer details to their sales reps.
Know more, so you can DO more with Act!